patio cafe under a tree-lined street. Just wandering through wide boulevards and French colonial architecture while dodging motorbikes (some carrying entire families ... and their chickens) and street vendors is enough of a highlight in itself, other attractions include temples, pagodas and a host of Vietnam war-era museums (including some of John McCain's possessions at the Hoa Lo Prison Museum, once better known as the Hanoi Hilton). Although there is a Hilton now in Hanoi (called the Hilton Hanoi Opera House), one of the charms of Hanoi is in its relatively inexpensive small hotels, many centered in the millennium-old Old Quarter. 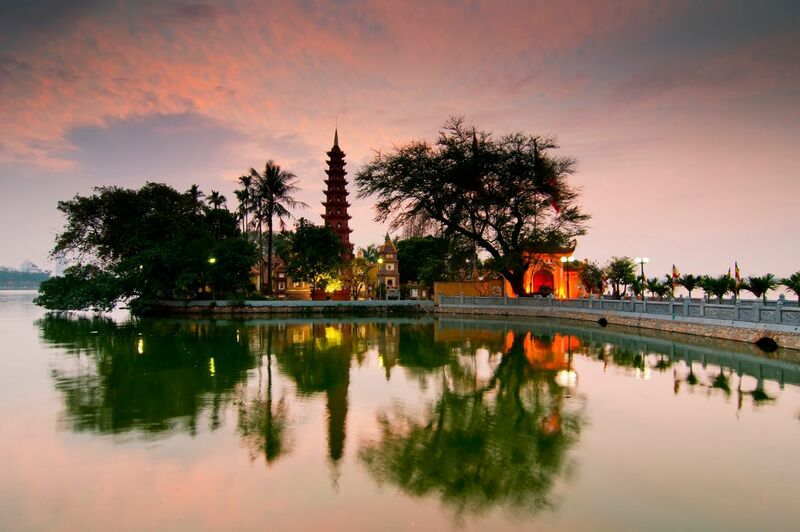 Stroll over to the happening French Quarter or the scenic Hoan Kiem Lake for dinner at a restaurant where the luscious surroundings are as appetizing as the impeccably prepared Vietnamese and fusion dishes. sweltering, making it hard to stay outdoors for more than a few hours at a time, and although the winter lows in the 50s (10-15C) don’t look too menacing, the humidity and general lack of insulation in buildings makes it feel much cooler. People aren't kidding when they say Vietnam is friendly. I know Thailand is officially the land of smiles, but everyone I encountered there was friendly. The pho and Bánh mì are to die for, the fruit is delicious, and the coffee-I took bags and bags home. The tour of Halong Bay was amazing, and I loved the Note coffee shop. Fascinating city in the north of Vietnam with lots of street activity and local culture, and of course delicious food. My friend and I were travelling together. We have some very interesting experience, you have to overcome difficult to open new tourism ideas. I feel interesting to your home and travel with the style of your company experience. I hope you will help your foreign create professional style and very unique experience. Indochinavalue is one of the leading tour operator in Vietnam, an expert in tailor made tour in Vietnam, Laos, and Cambodia.Indochinavalue has head-office in Hanoi with 15 office staff (director, sales, tour operators, reservations, accounting, IT, drivers and tens of tour guides), branches in Sapa, Hue, Saigon and good partners in other tour destinations. Any Vietnam tour enquiry received by indochinavalue will be carefully taken care of and responsed quickly by one of Indochinavalue's experienced travel consultants who will give you helpful travel ideas, travel solutions and help you plan your memorable holiday in Vietnam and Indochina! Hanoi is a popular spot for tourists. You can see many destinations like Confucious Temple, Ho Chi Minh Mausolem and Ho Chi Minh's old house. Although the weather is very dusty but you can see many hawkers selling French bread by roadside. Hanoi is crazy and hectic! You learn to cross the street in a whole new way- look forward, keep the same pace, and pray that everyone avoids hitting you. There is some great food and some I wouldn't dare to eat. Beer is dirt cheap and the live entertainment is great. Also a great place to stock up on souvenirs as you can barter the prices low and there is a large variety of shops/markets. A lot of historical sites you can walk around to and the gateway to Halong Bay. Hanoi is a little too crazy for my taste but a great place to experience for a day or two. Hanoi is an amazingly unique and chaotic city. There is a lot to see and do all within a relatively small area. The best way to see Hanoi is to embrace the local culture and rent a motorbike. You can easily drive around most of the city in one day on a motorbike, just be careful, the traffic is pretty crazy.